Chrono Trigger is a role-playing video game developed and published by Square (now Square Enix) for the Super Nintendo Entertainment System in 1995. Square re-released a ported version by Tose in Japan for Sony's PlayStation in 1999, later repackaged with a Final Fantasy IV port as Final Fantasy Chronicles in 2001 for the North American market. 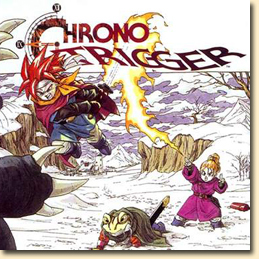 A slightly enhanced Chrono Trigger was released for the Nintendo DS on November 25, 2008, in North America and Japan, and went on sale in Australia on February 3, 2009 and in Europe on February 6, 2009. The game had not been released in PAL territories before the DS version. Chrono Trigger's development team included three designers that Square dubbed the "Dream Team": Hironobu Sakaguchi, the creator of the Final Fantasy series, and Yuji Horii and Akira Toriyama—two freelance designers known for their work on Enix's Dragon Quest series. Kazuhiko Aoki produced the game. Masato Kato wrote most of the plot, while composer Yasunori Mitsuda scored most of the game before falling ill and deferring remaining tracks to Final Fantasy composer Nobuo Uematsu. The game's story follows a group of adventurers who travel through time to prevent a global catastrophe.